Coupled social-ecological systems (SES) exist where humans intimately engage with ecological systems. These "man-in-nature" systems have existed as long as humanity. The closeness of the systems coupling varies across communities, regions, and cultures. The ability to map landscape values makes it possible to display regions that contain significant social as well as ecological value. We call these areas social-ecological hotspots. Social-ecological hotspots are locales that exhibit spatial coincidence of both high perceived landscape values and a high rating for biophysical conditions. For example, a SES hotspot might occur in an area perceived by community members to have high biological value along with high biological productivity as determined using a quantitative measurement such as net primary productivity. SES hotspot areas are likely to be more highly contested landscapes because of their importance on multiple levels. "Warm spots", in contrast to "hot spots", are areas of high biological productivity but moderate to low perceived human value. These areas are good candidates for ecological protection and conservation policies because there is likely to be less human conflict over their protection. These are the "low hanging fruit" for conservation efforts. SES hotspot maps provide a visual tool for land planners and managers that enables the visualization of human/landscape relationships. 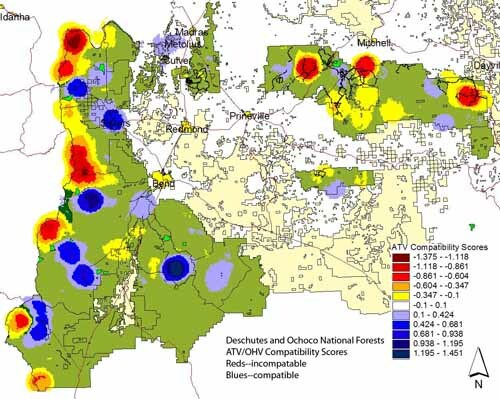 The identification of SES hotspots can help identify areas of high concern (e.g., conflicting landscape values), areas of intense sociocultural/biophysical processes (e.g., a highly valued area for recreation which is physically fragile), or prospective conservation areas with high ecological value but low social value. The map below depicts social-ecological hotspots for the Kenai Peninsula in Alaska (U.S.A.). 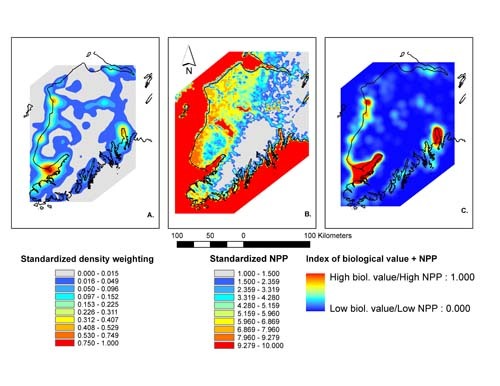 Figure A (left) shows high biological landscape value as perceived by residents of the Kenai Peninsula. Figure B (middle) shows high net primary biological productivity, and Figure C (right) shows the overlay or spatial convergence between high biological landscape value and net primary productivity.